Empty and re-load the dishwasher. Cook something to bring for work lunches this week. Work on a schedule for the blog. 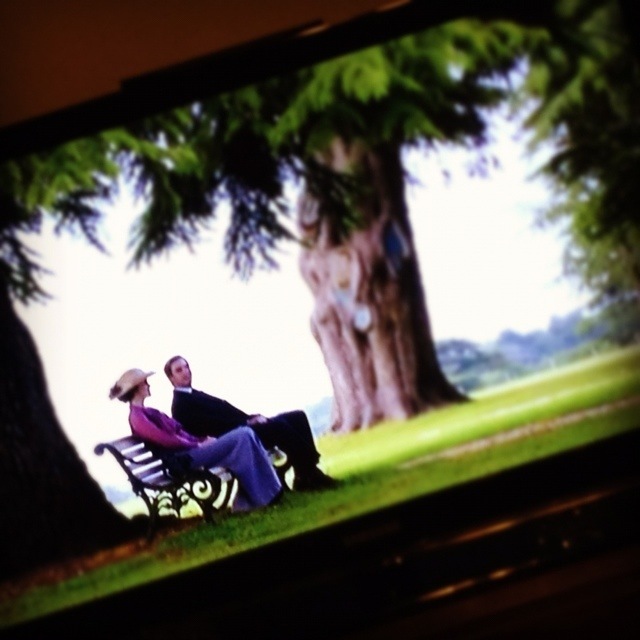 I’m six episodes into the seven-episode first season and I’m pretty sure I have no capacity to stop watching now – not even the Caps game starting at 5:00 will be enough to tear me away from the early 20th century upstairs-downstairs adventures (and misadventures) of the Crawley family and their servants. It’s an extraordinarily addictive, ultra-soapy costume drama… And I am totally hooked! It’s really a good thing that I have dinner plans with friends tonight, or I’d never even make it out of the house. So, you have an extra day off tomorrow to do your “to-do” list. Good for you for enjoying your extra day :). Y E A H !! Too cold here to go out other than to supervise Toby meeting his immediate needs, so I’ve knitted my second rolled-brimmed hat & matching scarf, talked on the phone, done some laundry & dishes, and am now cooking dinner. Not a terribly taxing day. Also watched part of the Texas/Ravens game (pretty good actually). MENU: Baked potato skins with mixture of LF sour cream & cheese and bacon-like bits made out of turkey pepperoni. (Real easy to do — just snibble up slices of P into smallish bits & nuke between double layers of paper towel for about 1 minute until they crackle. They crisp up & crunch & taste awesome.). Also baking some BBQ wings and will have a clementine for goodness :). ENJOY your dinner out!!! Yep… that was me on Wednesday night! I have last night’s 2nd season episode on DVR right now and I’m going out of my mind because I don’t have time to watch it right now…arrrg! At least you watched your marathon during the day. I made the mistake at starting at 8pm and going through 3am because I couldn’t stop watching. Well, I watched season one during the day. I got home from dinner last night at 11 and decided to watch the beginning of season two, which is three more hours of watching. I didn’t get to bed until 2:00 a.m.
Downton Abbey rocks. I still need a fancy hat.